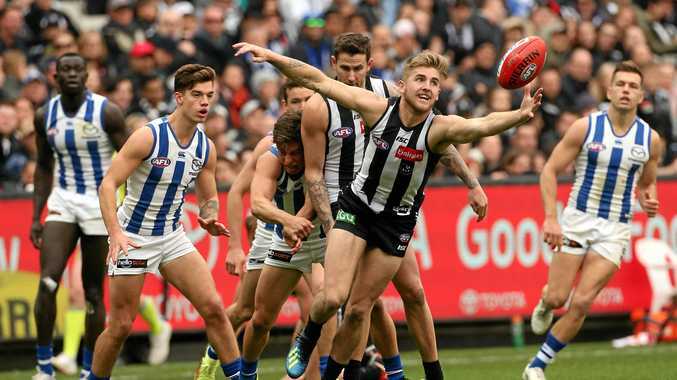 COLLINGWOOD has consolidated its top-four credentials and dented North Melbourne's AFL finals hopes with a 66-point belting at the MCG. The Magpies superbly overcame the late withdrawal of key defender Darcy Moore to dominate the Kangaroos on Saturday, 20.10 (130) to 9.10 (64). Collingwood have 12 wins with five rounds left, confirming its first finals berth since 2013. But it's a question of how deep the Magpies can go into September, given they started this round in third spot. By contrast, North are a game outside the eight. The Pies were potentially vulnerable on Saturday, given their seven-game winning streak ended with last Sunday's loss to West Coast. Then, as the teams ran out, it emerged that Moore was ruled out with hamstring soreness - a week after he had returned from a hamstring injury. New forward Brody Mihocek kicked two goals in the opening eight minutes, immediately dispelling any notion that Collingwood might be in trouble. As North sprayed three behinds, the Magpies slammed through six goals straight to take control. Collingwood started with 7.2, its best first quarter of the season and the second-highest term overall this year from the Pies. Trailing by 29 points at quarter-time and then 41 early in the second, the Kangaroos rallied and worked back into the game. But as North closed to 27 points, Collingwood killed off the match with three quick goals before half-time for a 45-point lead at the main break. Mihocek finished with four goals and Jordan De Goey continued his hot form with four goals as well. Taylor Adams and Scott Pendlebury starred in the midfield and Will Hoskin-Elliott (three goals) was also dangerous in attack. On a bleak day for the Roos, Majak Daw kicked three goals and Shaun Higgins and Ben Cunnington were solid in the midfield. North defender Marley Williams will come under video scrutiny for a crude spoil on Jaidyn Stephenson. Fellow Kangaroos backman Scott Thompson also had a dirty day, forced off the ground twice with cuts to his head.